I try to eat healthy and eat as many vegetables as I can everyday. I do eat meat, but I am just as happy eating a flavorful bowl of vegetables. My cooking dilemma is that I married a carnivore and he's always asking "where's the beef". This dish is really satisfying because of all the texture you get from the "meat" like mushrooms, water chestnuts and baby corn. So even though there was no meat, he enjoyed it. It's not exactly vegetarian because I did use chicken broth and oyster sauce. But you can make some quick substitutions with vegetable broth and mushroom sauce to make this dish fully vegetarian if you like. This dish can be quickly tailored to what you have in your produce bin in the fridge. It's a what I call a "clean out the fridge" dish. 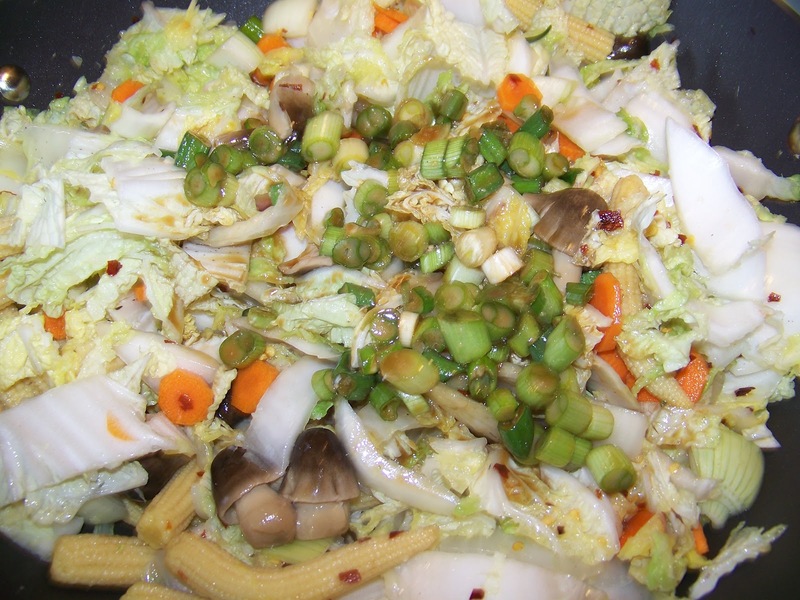 So don't let those starting to wilt veggies go to waste, make this wonderful meal and enjoy. Note: You can always add any protein to this dish if you wish. 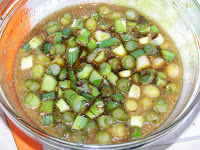 Just add the sliced beef, chicken, or pork after you saute the ginger and garlic. Shrimp can be added the last five minutes of cooking so they don't get overcooked. Note 2: If you want to keep it vegetarian, you can add some tofu. I would press the tofu (to remove excess water) then season it with salt and black pepper and cut it into large bite size cubes. 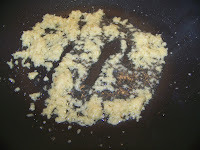 Then saute/fry to brown them in some oil . 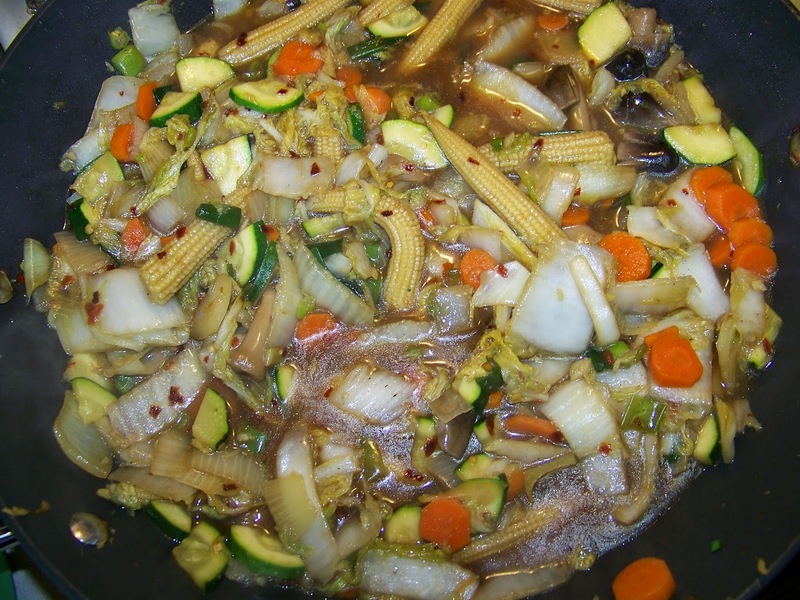 Take them out of the wok (reserve on a plate until later) and proceed with the recipe as written. Finally add the cooked tofu back into the recipe for the last few minutes of cooking to absorb the sauce and flavors. Heat 1-2 Tbs of canola oil in a wok. Once heated add ginger and garlic and stir fry for 30-45 seconds. Then add the Napa cabbage and all your raw vegetables and stir fry for 2-3 minutes. Then add the canned vegetables and red chili flakes. Finally add the prepared stir fry sauce. Stir fry all ingredients for 3-4 minutes until vegetables are cooked to your desired tenderness. Taste for seasoning and serve over rice or noodles. Garnish with green onions tops. Enjoy. Very healthy and colorful stir fry. Looks yummy.. The curry looks terrific. Ramona, I have been looking for Oyster mushroom sauce from quite some time. Even asked at a specialty store (Galloway)near my house, but they do not carry. 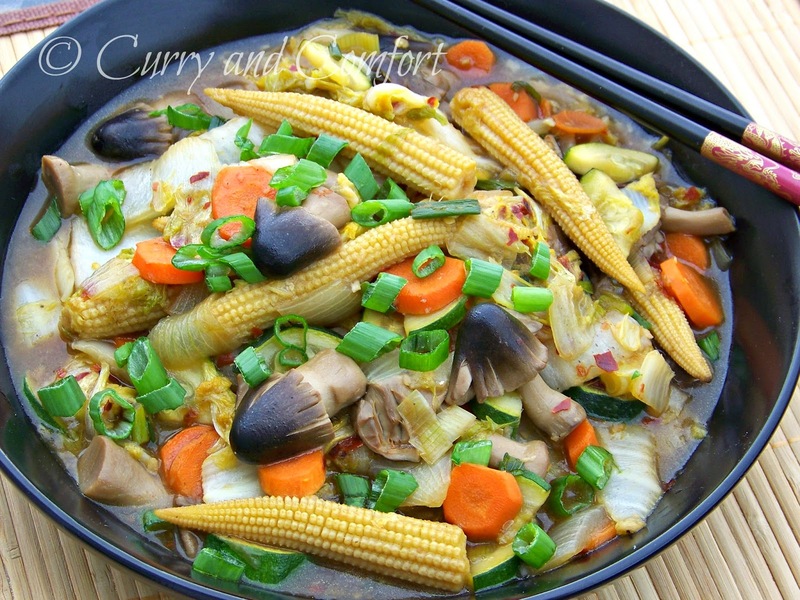 Do you know any particular store name which carries Oyster mushroom sauce? Mmm this looks so good! I haven't had stir fry in a while and you're recipe is causing a serious craving! I actually think I prefer my stir fries all veggie, it's so fantastic that the meat gets lost! And your broth looks truly amazing! Yum!! Wow, talk about nutrition. Looks good - love my veggies! I love reading Kiri's stuff as well - I'm always blown away by the little things I learn! I love stir-fries. They're loaded with bright colorful veggies and are packed with flavor. This recipe sounds so tasty and easy to prepare. Thank you for sharing. My mouth is watering from those pictures. what a great stir fry. I want to make this as soon as I get home. I saw a photo of this over on Kiri's blog. It looks so good! I hate to admit how much I love those oyster mushrooms. You're driving me nuts with this delicious stir fry! Love all of the great vegetables and the sauce - YUM! 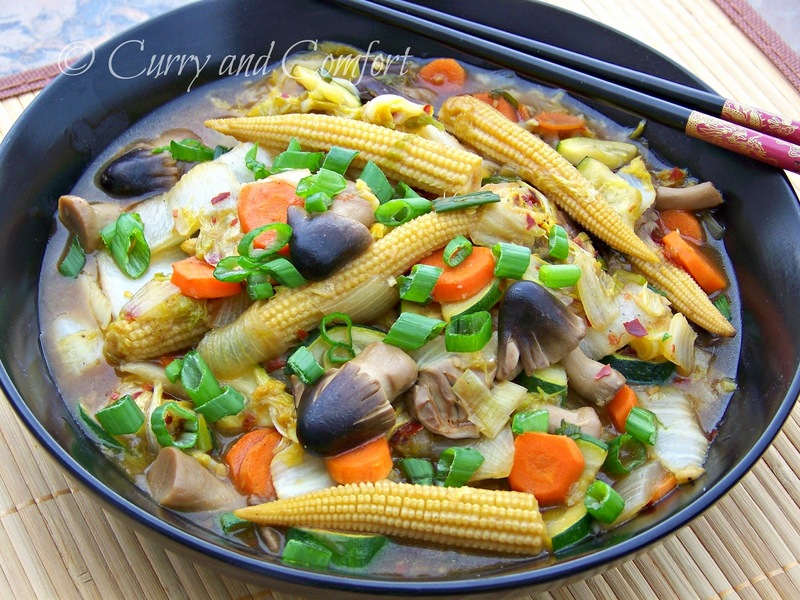 I don't use the baby corn or the oyster mushrooms much, but when I do, I love them! Great photo! Clean out the fridge dishes are like going on a treasure hunt. You struck gold with this one! The photo made me run out and buy what I needed to make this dish. It is every bit as delicious as it looks in the photo. This is going to be staple in my house. If you don't have a wok what kind of pan can you use to do stir fry? Loving this one! With a few substitutions I can make it totally vegetarian! You can use a large frying pan. 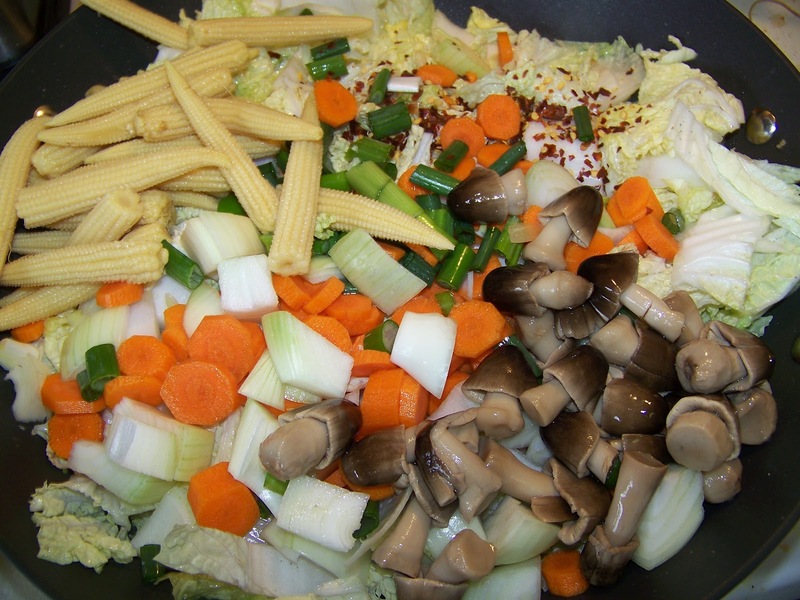 Any pan that will fit all the veggies works. :) Hope you enjoy!